Has the time for iris biometrics come? When talking about biometric technologies the list typically goes fingerprint and then iris, in that order. Fingerprint biometrics have been the standard because it has been around longer and have a proven track record. But advances in iris technology along with new vendors and products may signal that the technology is about to take off. The U.S. Department of Homeland Security has tested iris systems from three vendors for possible use with the US VISIT program, which checks all foreign visitors’ fingerprints against a watch list. Iris will also be integrated into the FBI’s Next Generation Identification (NGI) system. The NGI is replacing the Integrated Automated Fingerprint Identification System, which incorporated fingerprints and biographical data. The new system adds iris as well as photos of tattoos to the profile. “Fingerprints are the dominant one in terms of shear numbers but iris will start to catch on,” says Victor Lee, senor consultant at the New York-based International Biometric Group. Iris is already more popular in the middle east, where the technology has seen its largest deployments, he adds. But the technology may be starting to catch on in the U.S. and other western countries. Multiple vendors are offering systems that are easier to use than earlier systems and more initiatives, such as electronic passport projects in Europe, are calling for iris. At Homeland Security, iris was tested as part of its Multi-Biometric Technology Evaluation (MBTE) project, an on-going technology evaluation that US VISIT started in January 2008. This is a effort launched in partnership with the National Security Agency, the U.S. Naval Academy and the National Institute of Standards and Technology to examine alternative approaches to capture biometrics to improve security and facilitate entry. In July 2008, the evaluation team collected data from individual iris technology vendors. This evaluation was conducted in a laboratory environment, and the data was used to determine the level of image quality. The test looked at cameras from LG, AOptix and HBox. In November of 2008, the MBTE team provided a demonstration of interoperability of iris sensors in a multi-vendor environment. The demonstration showed live matching across iris systems from multiple vendors. In addition to the demonstration, evaluation data was collected to measure “real world” metrics including failure to enroll and failure to acquire rates. More than 100 US-VISIT employees and contractors participated in the MBTE evaluation phases at US VISIT headquarters. Details of the next step of the projects were not available as of press time. Cultural issues have been an obstacle for iris biometrics in western countries and a reason why it has thrived in the Middle East, says Tim Meyeroff, director of North American sales at LG Iris. The Middle East has the largest deployment of iris technology, using it for border control and other applications. The iris cameras in place require the user to be 10 to 14 inches in order to authenticate, Meyeroff says. For westerners this is uncomfortable, but not so for middle easterners. “It’s more culturally acceptable to be that close to someone and be comfortable with it,” he says. And while this has worked in iris biometrics’ favor, the same cultural issues have held fingerprints back in that region, Meyeroff says. “There’s a much greater hesitation to touch something in the Middle East,” he says. Lee says iris is in a position to start making up some ground on fingerprints. An individual’s iris pattern remains stable after the age of one year, but many factors can cause fingerprints to change. Some also say that iris is more difficult to spoof than fingerprints. Usability has been the major knock against iris, Lee says. For some cameras a user had to get within inches of the scanner and it took some manipulation for enrollment and subsequent authentications. It also was difficult for taller people to use the systems because the cameras would be mounted at a lower position causing problems authenticating. The newer iris systems attempt to solve these usability issues. These “iris at a distance” and “iris on the move” products can authenticate individuals from three to five feet away. But the systems are all fairly new and have few, if any, deployments. 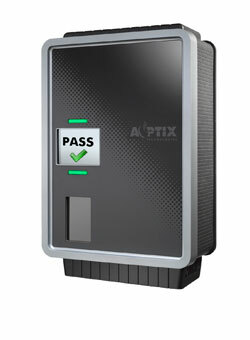 AOptix Technologies Inc. rolled out its first iris-at-a-distance product in March. The Campbell, Calif.-based company is a Silicon Valley startup founded by astronomers from the University of Hawaii, says Phil Tusa, the company’s vice president of biometric programs. The astronomers were working with adaptive optics for deep space imaging, “to improve imaging quality by correcting for the atmospheric disturbances,” he says. It occurred to developers that the same image correction techniques could improve iris biometric imaging. Other products don’t have this requirement, but by asking for it AOptix says it can get better images and lower the failure-to-acquire rate, Tusa says. The system can also communicate with the user and tell him where to stand. With systems that don’t require a user to stop this would be problematic. The AOptix device can capture iris images and facial images at the same time. The first products will ship in April, Tusa says. Most of the first systems are going for pilots and other demonstrations. Sarnoff Corp. and Global Rainmakers Inc. classify their technologies as iris on the move or in motion. Both authenticate individuals as they go through a checkpoint. For example, a camera could be set up at an airport security checkpoint and authenticate travelers as they move through the metal detector. Along with the US VISIT project, Sarnoff participated in a test at Schipol International Airport in Amsterdam. Iris technology has been in use there for its trusted traveler program for years and the airport is thinking about upgrading, says Ray Kolczynski, product manager at the Princeton, N.J.-based company. Sarnoff Corp. offers a complete portal product to its iris customers. Sarnoff says it can capture iris images at about 10 feet and process 30 individuals a minute, Kolczynski says. But the system could be tuned to pick up images from as much as 98 feet away. “We offer real time capture with minimal user cooperation,” he says. Through the years Sarnoff has received funding from the U.S. intelligence community, including the National Security Agency, the CIA and Department of Defense, Kolczynski says. The individuals involved with Global Rainmakers’ technology participated in some of the first iris systems. Keith Hanna, Chief Technology Officer and executive vice president at Global Rainmakers, worked with John Daugman, who holds some of the first patents on iris recognition technology. Hanna is now a partner with Global Rainmakers and helped create the HBox, says Hector Hoyos, president and CEO at the New York-based company. The HBox technology is capable of authenticating 50 people per minute without any user cooperation at between five- and six-feet away, Hoyos says. Hoyos says its eye swipe portal will retail for $1,995. AOptix hasn’t released final pricing, but Tusa says the system is more expensive than high-end fingerprint scanners like those being used for US VISIT, but lower than iris-on-the-move devices.